Anybody else getting dodgy texts about a United Energy power surge? Has anybody else had one of these, possibly dodgy, texts? This is the second one I’ve received now. After the first I replied “Wrong number” and got a “Sorry” back, but the guy is persistent. Something smells fishy. 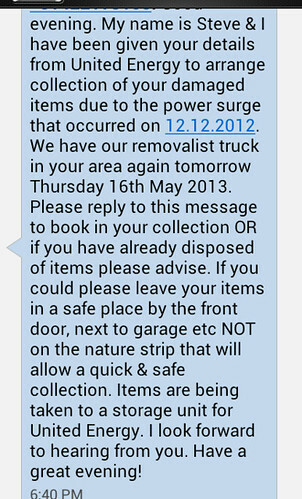 Note the supposed pick-up date, which is last Thursday, three days before the text was received. 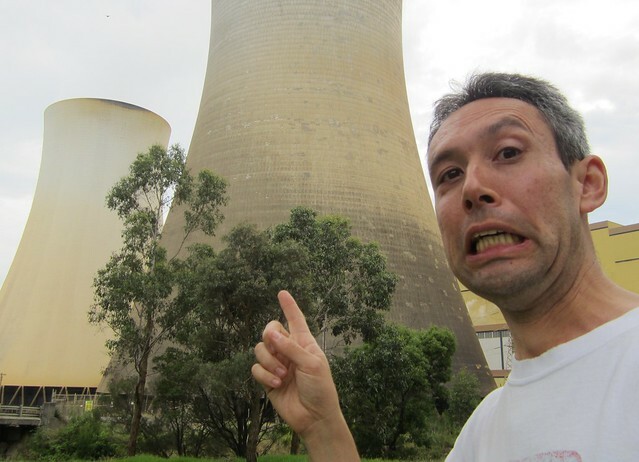 When I mentioned it on Twitter last night, Marcus Wong noted that there was a power surge around that day (actually on the 11th if the 3AW article is accurate), on the Mornington Peninsula. United Energy is a distributor, not a retailer — many people in Melbourne’s south-east are connected via them, even if another company is the one sending them the bills. Of course, it could just be a wrong number plus poor record-keeping. The number of emails I get for someone, who apparently shares my name but has no idea of their own email address, is amazing. On the way back from Walhalla, we decided (at Peter’s suggestion) to go via Yallourn. He said there was a lookout with a good view over the Latrobe Valley, and the power plants, and the road through Yallourn was very close to one of them..
We started off by diverting off the road to a spot called Peterson’s lookout. This turned out to be a long narrow dirt road to a view which, you’d have to say, wasn’t outstanding — but reading up on it now it sounds like we needed to go a little further down the road for the real view. In any case there was a better more-accessible view a bit further along, on the main road itself. Looking over the Valley, you could see a fair bit of haze, and many smokestacks in various directions. We drove on, stopping briefly in the town of Yallourn North, which apparently originally opened as the romantically named “Brown Coal Mine” in 1917, and was renamed in 1947. There’s still a Brown Coal Mine Road leading into the eastern side of town, though the signs seem to have disappeared in favour of the less descriptive C103. A little further on was the power station itself. It looms, huge, over the road. We stopped off in the viewing area, which has a picnic barbecue, powered by — you guessed it — electricity. The cooling towers are impressively large. Of course, they often shows these on the news when talking about carbon emissions, even though (as I understand it) it’s steam that comes out of them, not the smoke from burning coal. Down the road a bit was an open cut mine viewing area. 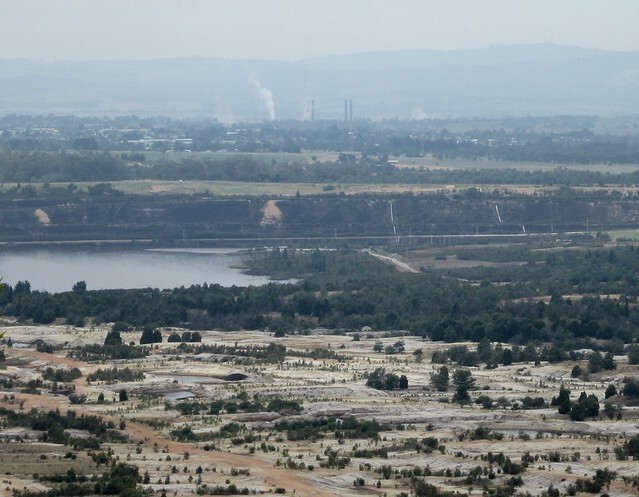 It’s not hard to see how decades of mining for coal has ravaged the landscape. It ain’t beautiful, that’s for sure. But one could argue that farms of wind turbines or solar panels or dams aren’t beautiful either. You know, eye of the beholder and all that. The real problem is the emissions. 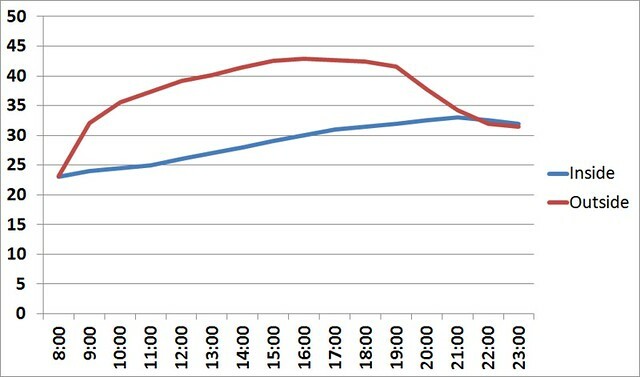 Yallourn isn’t as dirty as Hazelwood, but as this table notes, coal sits at about 1000 grams of CO2 per kilowatt hour over the lifecycle of the generator, compared with about 10 for wind or hydroelectric, or 32 for solar. In other words, even the cleanest coal is much, much dirtier than renewables. And while there might be doubts about a single renewable source being able to provide baseload power, other countries such as Germany are using a variety of sources, with a stated aim of 35% renewable electricity by 2020, and 80% by 2050. Impressive stuff, and I bet we get more sun than they do.